Laser cutting, welding, and hot working leave a discolored oxidized layer or scale on the surface of the worked steel. This must be removed in order to perform many of the surface finishing processes. The acid pickling process is used to remove the oxide or scale of metals and corrosion products, in which acids or acid mixtures are used. Acid cleaning is also used for removing inorganic contaminant not removable by other primary cleaning solutions. Acid cleaning has its limitations in that it is difficult to handle because of its cor-rosiveness and is not applicable to all steels. Hydrogen embrittlement becomes a problem for some alloys and high-carbon steels. The hydrogen from the acid reacts with the surface and makes it brittle and crack. Because of its high reactivity to treatable steels, acid concentrations and solution temperatures must be kept under control to ensure desired pickling rates. Technically speaking, acid pickling is a treatment of metallic surfaces that is done to remove impurities, stains, rust, or scale with a solution called pickle liquor, containing strong mineral acids, before subsequent processing, such as extrusion, rolling, painting, galvanizing, or plating with tin or chromium. The two acids commonly used are hydrochloric acid and sulfuric acid. Carbon steel is pickled usually by either sulfuric acid or hydrochloric acid. At one time, sulfuric acid was the pickling agent of choice for picklers running integrated steel works.1 Hydrochloric acid is chosen in more modern lines when bright surfaces, low energy consumption, reduced overpick-ling, and the total recovery of the pickling agent from the waste pickle liquor are desired. The spent pickling liquor is called waste pickling liquor (WPL), which must be properly treated for disposal or reuse. Wastewaters from pickling include acidic rinse waters, metallic salts, and waste acid. WPL is considered a hazardous waste by the U.S. Environmental Protection Agency (U.S. EPA). Pickle solutions that are used in the removal of metal oxides or scales and corrosion products are acids or acid mixtures. Depending on the product being pickled, the acid pickling operation can be a batch or continuous process. In continuous strip pickling, more water is required for several operations such as the uncoilers, looping pit, and coilers. In the case of pickling hot rolled coils, the coils are transported to the pickling line. In the uncoiler section, the coil is fed through a pit containing water for washing off the surface dirt and then fed through the pickling line. Lime or alkaline substances are used to neutralize the waste pickle liquor. In addition, 5-day biochemical oxygen demand (BOD5), chemical oxygen demand (COD), total suspended solids (TSS), oil and grease (O&G), ammonium nitrogen (NH4+ -N), pH, cyanides, fish toxicity, and several relevant metal ions such as cadmium (Cd2+), iron (Fe2+), zinc (Zn2+), nickel (Ni2+), copper (Cu2+), and chromate (Cr6+) have to be reduced below the maximum allowable limits. Some acid pickling plants, particularly those using hydrochloric acid, operate acid recovery plants where the mineral acid is boiled away from the iron salts, but there still remains a large volume of highly acid ferrous sulfate or ferrous chloride to be disposed of. Since the 1960s, total hydrochloric acid regeneration processes have reached widespread acceptance.5 The by-product of nitric acid pickling is marketable to a couple of secondary industries including fertilizers. In hot rolling processes, pickling is used for further processing to obtain the surface finish and proper mechanical properties of a product. 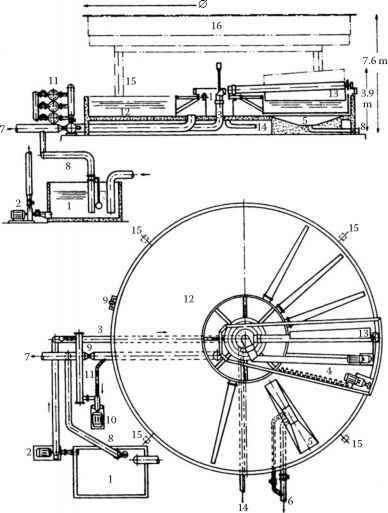 In the case of pickling hot rolled coils, the coil is fed through a pit containing water for washing off surface dirt and then fed through the pickling line. In the pickling section, the coil strip comes in contact with the pickle liquor (sulfuric or hydrochloric acid). Wastewater sources are processor water, waste pickle liquor, and rinse water. In the case of batch pickling, the product is dipped into a pickling tank and then rinsed in a series of tanks. The quantity of wastewater discharged from a batch process is less than that from continuous operation. The wastewater is usually treated by neutralization and sedimentation. The ferrous sulfate that is formed in the above reaction is either monohydrate or heptahydrate (FeSO4 ■ 7H2O). Pickling is conducted by continuous, semicontinuous, or batch modes depending on the form of metal processed. In developing a National Emission Standard for the steel pickling industry, U.S. The treated wastewater effluents, in general, can be either discharged to a watercourse or a public sewer system. In the former case, the treatment requirements will be more stringent. The most commonly used methods are the first two. In old plants, neutralization and sedimentation are applied to the treatment of wastewaters in general, including WPL. A typical treatment system for continuous pickling water is shown in Figure 28.1.1,3 In an integrated steel mill, a central wastewater treatment system is used to treat wastewater from pickling lines, cold rolling mills, and coating lines. skimmed, and the water phase containing 200-300 mg/L of oils is treated together with the wastewaters from pickling, cold rolling, and coating lines. The combined wastewater flows to a settling and skimming tank where solids and oil are removed. The effluent from the settling/skimming tank is then treated in a series of settling tanks where chemicals (coagulants and/or lime) and air are added to oxidize the remaining iron to ferric ions (Fe3+), to further break the oil emulsions and neutralize the excess acid in the wastewater. The effluent from the mixing tanks then enters a flocculator/clarifier system, the overflow from the clarifier is discharged, and the settled sludge is pumped to a dewatering system consisting of centrifuges, belt, or vacuum filters. The dewatered sludge is disposed and the water phase returned to the clarifier effluent. The clarifier shown in Figure 28.1 can be either a sedimentation clarifier, a DAF clarifier, or a dissolved air flotation-filtration (DAFF) clarifier, depending on the space availability, pretreatment requirements, effluent limitations, and costs.6-11 Modern pickling plants use DAF or DAFF for more cost-effective clarification or more efficient clarification, respectively. 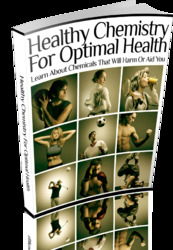 The use of lime or other alkaline substances to neutralize acid is quite costly, especially when large capacities are involved. Also there are potential values in the acids and ferrous ion, and therefore, recovery of these substances will not only reduce the pollution load, but their sale or reuse will represent a profit to the industry. Crystallization is one of the treatment methods for sulfuric acid waste pickle liquor. Thus, it is possible to decrease the pollution load and at the same time recover various hydrates of FeSO4. The crystallization of FeSO4 depends on the characteristics of the water and acid, and solubility of FeSO4. The solubility of ferrous sulfate as a function of temperature and sulfuric acid concentration is shown in Figure 28.2.4 In this figure, FeSO4 ■ 7H2O is dominant in region A, FeSO4 ■ 4H2O in region B, and FeSO4 ■ H2O in region C.
The crystallization of ferrous sulfate as heptahydrate is commonly used today. The concentration of iron in the acid bath is approximately 80 g/L as Fe3+. The crystallization of FeSO4 ■ 7H2O is achieved by cooling the acid waters in heat exchangers or evaporation under vacuum after pickling. Make-up acid must be added to the bath. During countercurrent cooling, the acid bath waste passes through two to three crystallization tanks and is cooled down between 0°C and 5°C. The crystallized ferric sulfates are recovered by centrifuging. 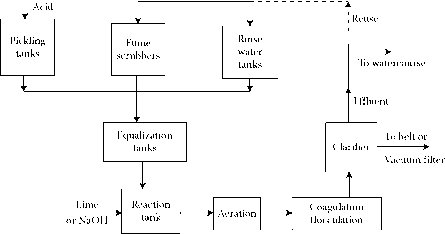 A typical flow diagram of FeSO4 ■ 7H2O crystallization is shown in Figure 28.3. The WPL is sprayed above a cyclone crystallizer, and air is blown from the bottom countercurrent to the liquid. A packing material is also present in order to increase the area of contact between the air and the liquid. The acid wastewaters are then cooled, and the FeSO4 ■ 7H2O crystals are recovered by centrifuging. goes to a roaster in which it is converted to ferric oxide. The gases liberated from the roaster and the acid from the centrifuge go to a degassing chamber, and the sulfuric acid is removed and returned to the pickling process, or can be sold. The remaining gases from the degasser are passed through an absorption system and then reused in the reaction chamber. In the Lurgi process1 that was developed in Germany, hydrochloric acid is recovered from the WPL. The acid is regenerated in a fluidized bed. During pickling with HCl, the acid circulates between a pickling tank and a storage tank and the acid reacts with the iron oxide scale from the steel producing ferric chloride, resulting in increasing concentration of dissolved iron and decreasing concentration of acid. In the Lurgi system,1 the acid level in the pickling liquor stays constant at about 10%. A continuous bleed stream is removed from the system at the same rate as it is pickled. The bleed stream, or spent pickle, is fed to a pre-evaporator and heated with gases from the regeneration reactor. Concentrated liquor from the pre-evaporator then enters the lower part of the reactor containing 13% acid and 20% ferrous chloride. The reactor contains a fluidized bed of sand and is fired by oil or gas to maintain an operating temperature of about 800°C. The reaction products leave from the top of the reactor. The ferric oxide is removed by a cyclone, and the hot gases enter the pre-evaporator. The overhead from the evaporator, which is at a temperature of about 120°C, contains water vapor, HCl, combustion products, and also some HCl that vaporizes directly from the plant liquor that enters the system. 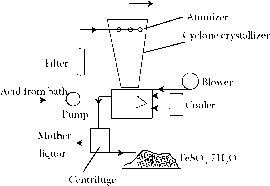 The gas mixture from the pre-evaporator enters the bottom of the adiabatic absorption tower, where HCl is absorbed by another bleed stream of the pickle liquor, and thus the regenerated acid is placed back in the pickle liquor circuit. The regenerated acid contains 12% acid and about 70 g/L of iron. The unabsorbed gases move to a condenser. This study was conducted at Cayirova Boru Sanayii AS (a galvanized pipe manufacturing factory) in Gebze, Kocaeli, Turkey.1,3 At this plant, batch pickling is applied. During the manufacturing process, the pipes are immersed in an acid bath that contains 25% sulfuric acid at 80°C and then prepared for the galvanization process by passing through cold water, hot water, and flux baths. The purpose of a cold water bath is to clean the acid from the surface of the pipes following pickling. A hot bath is applied in order to dry and prevent water and acid from entering a flux bath. The purpose of the flux bath, in which ammonium zinc chloride (NH4ZnCl3) is used, is to prepare a suitable surface for galvanization and prevent oxidation of the pipe. 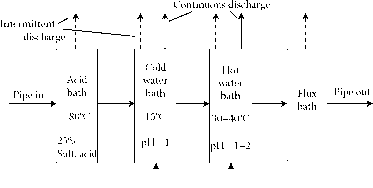 The flow diagram of the baths is shown in Figure 28.4. Quantities of Wastewater Required for 1000 mL "Mixed Wastewater"
The experiments conducted on wastewaters, the results of which were shown in the previous section, indicated that neutralization/aeration/settling gave satisfactory results. The sludge formed must be disposed after dewatering in a filter press, a horizontal belt filter, or a centrifuge. An equalization tank is required in order to compensate for the effects of intermittent discharges. The treated wastewater can then be recycled to be used in the process or discharged to the river. The flow diagram of the selected system is shown in Figure 28.5. Hydrochloric acid aerosols are produced and released into the air during the pickling process as HCl volatilizes, and steam and hydrogen gas with entrained acid fumes rise from the surface of the pickling tank and from the pickled material as it is transferred from the pickling tank to the rinse tank. Pickling and rinse tanks are covered and the acid fumes are generally collected and treated by control devices (e.g., packed tower scrubbers) to remove HCl. Emissions from many batch operations are uncontrolled. Pickling is sometimes accomplished in vertical spray towers. In this process, all the HCl in the pickling solution produces hydrochloric acid aerosols that are also used. Acid storage tanks and loading and unloading operations are also potential sources of HCl emissions. Uncontrolled HCl emissions from a storage tank may be of the order of 0.07-0.4 tons per year (tpy) of HCl per tank, depending on the tank size and usage. For each million ton of steel processed at continuous coil or push-pull coil model facilities, storage tank losses are estimated to amount to 0.39 tpy. For other types of pickling facilities, storage tank losses are estimated to be about 11.19 tpy of HCl per million ton of steel processed. The U.S. EPA guidance for acid storage tanks can be applicable to storage tanks used in conjunction with the pickling process and may be extended to apply to the pickling process itself.6 For storage tanks, one applies the amount of hydrochloric acid aerosol generated from a tank under average 19 capacity and other conditions to the manufacturing threshold and multiplies that by the number of times the tank has been drawn down and refilled. The amount of acid aerosol manufactured during the pickling process can be similarly determined by the amount of HCl generated from the pickling tanks during the processing of a certain amount of material and scaling up that figure to apply to all the material processed by the same process and under the same conditions. The amount of hydrochloric acid aerosols lost from the pickling tanks counts toward the material released to air unless the aerosol is collected and removed before exiting the stack. The hydrochloric acid aerosol collected in a scrubber is converted to the nonaerosol form, not reportable; the hydrochloric acid aerosol removed by the scrubber is considered to have been treated for destruction. Hydrochloric acid may be recovered from the WPL in an acid regeneration process. This process has the potential for emitting significant amounts of hydrochloric acid aerosols. The annual capacities of 10 acid regeneration plants surveyed by the U.S. EPA5 ranged from 3.2 to 39.8 million gallons (MG) per year for a single facility. The spray roasting acid regeneration process is the dominant one presently employed. One older facility used a fluidized bed roasting process. Flue gas containing HCl goes to a venturi preconcentrator and an absorption column. There, the generated acid contains approximately 18% HCl by weight. Emissions from acid regeneration plants range from about 1 to more than 10 tpy from existing facilities with and without pollution control devices (controlled and uncontrolled facilities). Acid regeneration plants have storage tanks for spent and regenerated acid and these tanks are potential sources of HCl emissions. Emission estimates for uncontrolled and controlled storage tanks at acid regeneration facilities are 0.0126 and 0.008 tpy per 1000 gallons of storage capacity, respectively. Acid recovery systems are used to recover the free acid in the WPL. They are not employed in larger facilities because they recover only 2-4% free HCl from the spent acid, but leave the FeCl2 in the solution that must be processed or disposed of separately. These acid recovery systems are generally closed-loop processes that do not emit HCl. In their survey, U.S. EPA compiled data from different types of pickling operations and their estimated emissions.5 This information is reproduced in Table 28.11. In order to estimate emissions from pickling facilities, U.S. EPA developed 17 model plants to represent five types of pickling operations and one acid regeneration process.12 The model plants include one or more size variation for each process model. The model plants were developed from information obtained from a survey of steel pickling operations and control technologies. U.S. EPA estimated emission rates for model facilities. Using these emission rates and the production and hours of operation for the model pickling plants, emission factors were calculated. These appear in Table 28.12.
http://www.epa.gov/tri/TWebHelp/WebHelp/hcl_section_3_1_4_steel_pickling.htm Note: Mg = million grams. www.epa.gov/tri/TWebHelp/WebHelp/hcl_section_3_1_4_steel_pickling.htm a The production for acid regeneration facilities is in units of million gallons per year. b The emission factor units for acid regeneration facilities is in units of lb of HCl per million gallons of HCl produced. S: small; M: medium; L: large; U: uncontrolled; C: controlled. A National Emission Standard for Hazardous Air Pollutants (NESHAP) for new and existing hydrochloric acid process steel pickling lines and HCl regeneration plants pursuant to Section 112 of the Clean Air Act as amended in November 1990 has been proposed (62 FR 49051, September 18, 1997). The purpose of this rulemaking is to reduce emissions of HCl by about 8360 megagrams per year.